JEY OIL refining company is a leading company in bitumen industry which was established in 2003. Head office is located in Tehran and the factory is next to Isfahan Refinery. 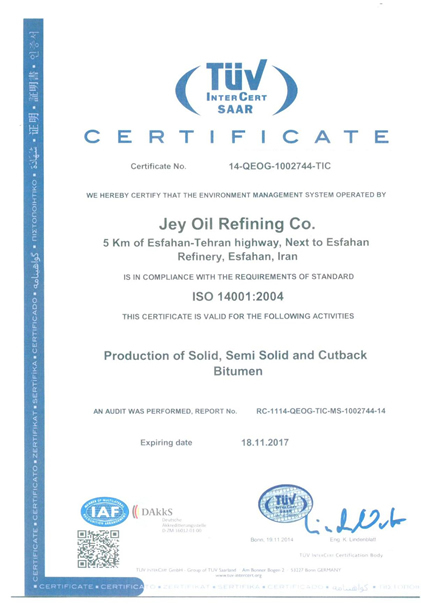 JEY owns one of the largest bitumen production units in the middle east which is producing various types of top quality bitumen in the world. 70% of our products are exporting globally. With our skilled human resources, we have over 40% of total bitumen production share in the country. 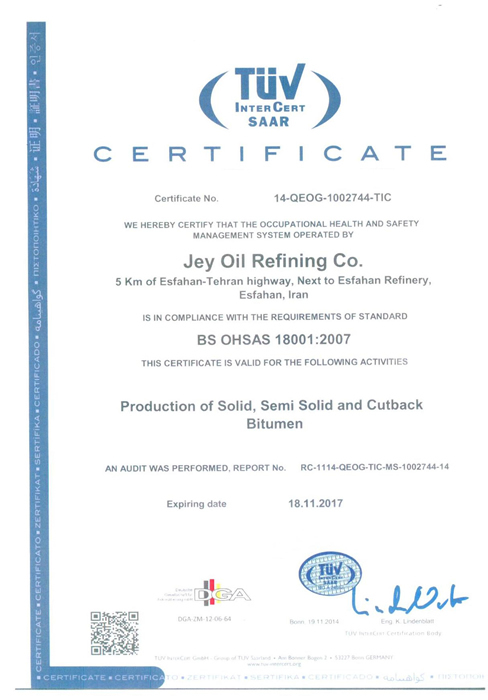 One of the major objectives of our company is to fulfill domestic demands based on the latest standards as well as successful presence in global markets by providing high quality products. We export 80% of our products to different European, Asian and African countries. The refinery has four separate bitumen production Units which are producing blown bitumen by two units, bitumen emulsion & cutback bitumen. 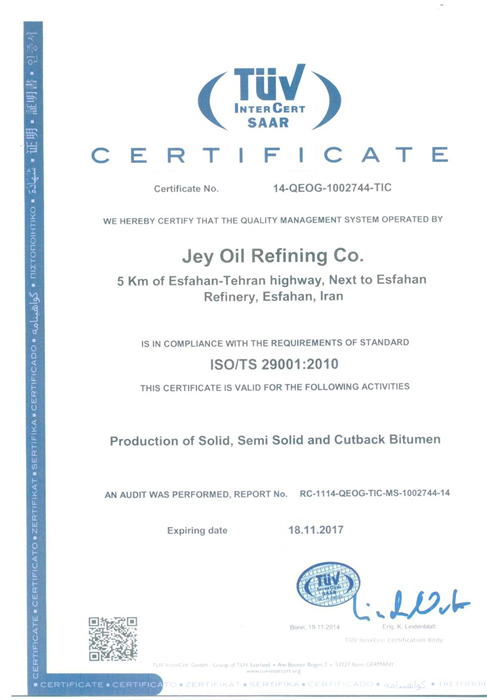 Air Blown Asphalt Capacity 40,000 BPD, Cutback Bitumen Capacity 7100 BPD, Bitumen Emulsion Capacity 20 T/hr, Storage Capacity 500,000 barrels. 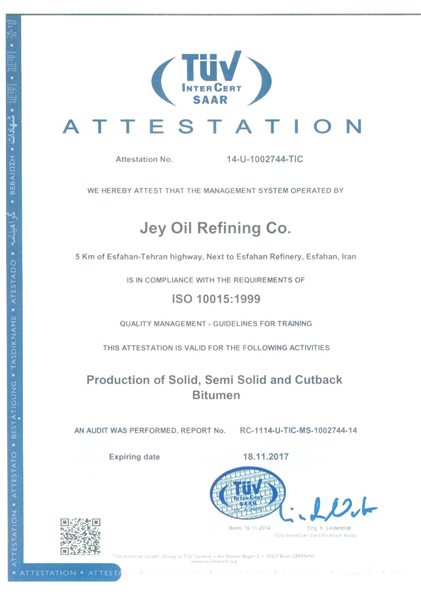 The products are in line with International Standards (Penetration Grade (ASTM) , Viscosity Grade (VG) ) and we have the ability to Produce Performance Grade (PG) & modified bitumen . Delivery Services are in bulk, drum & Jumbo Bags. We are proud to have certifications of CE, ISO/ IEC 17025: 2005, ISO9001:2000, ISO/TS 29001:2003, and because of our respect to standards of Health, Safety and Environment, we are honored to have ISO 14001:2004 & OHSAS 18001:1999 certificates too.